Le Mangii, situated in the industrial hub of Kamala Mills Compound, Lower Parel is the place to be at with your loved one this Valentines. We, the food blogging community, was invited for this ravishing pre-Valentines Bash to experiment with their Valentines Special Menu. 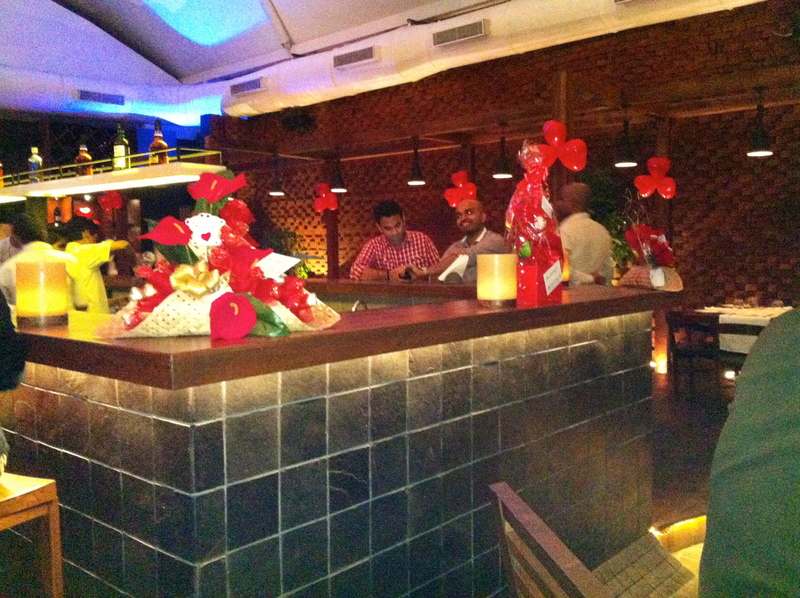 The restaurant had a bodacious ambiance with a dazzling bar and just the right amount of lighting to keep up the romance in the air! 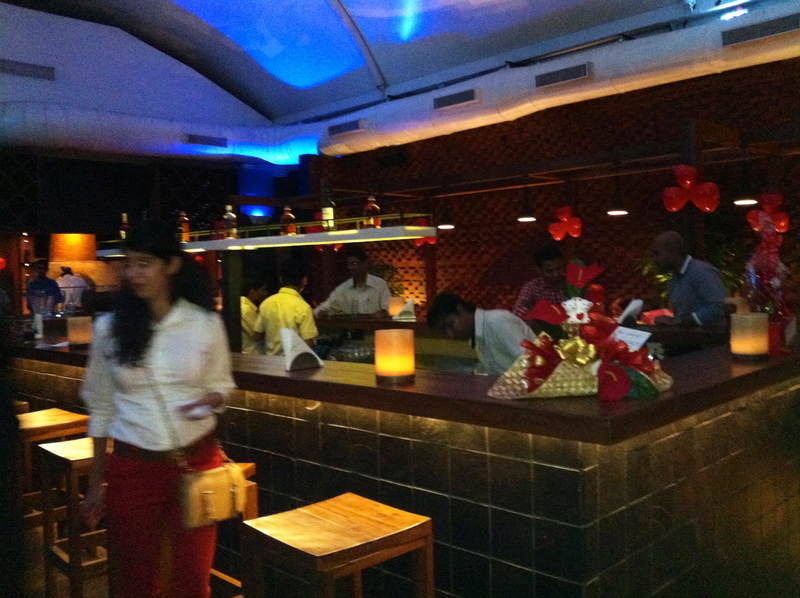 It had a variety of seating options as well, right from high chairs and high tables to the cozy and comfortable seats to the high rise chairs at the bar. We chose the high table and the high chairs! 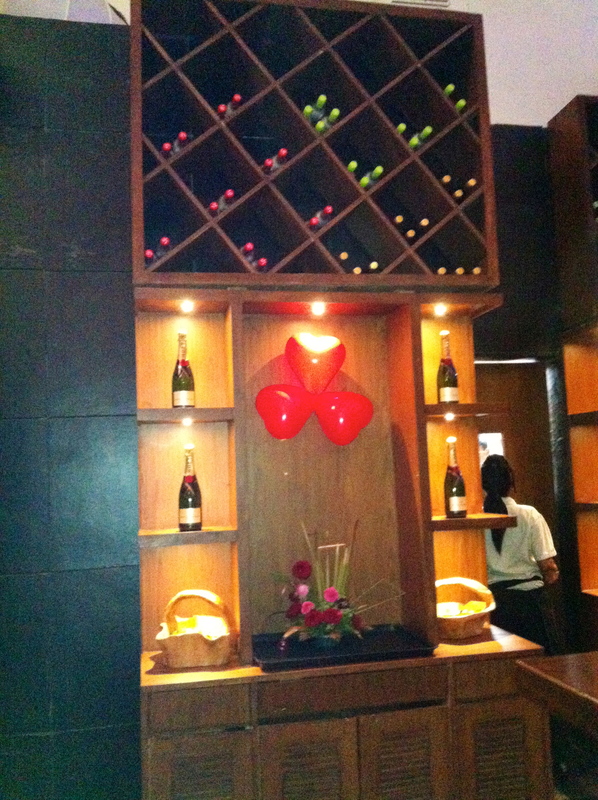 All the tables were candle lit and the mise en scène was just like a Valentines jamboree out of a Romantic movie. This place did not lack the verve and vigour of a fine dining restaurant but the ceiling reminded you of the fact that it was situated in one of the Industrial Parks of South Mumbai. The music here was nice, loud and just right for a shindig! We were soon offered some drinks and we could over hear people praising the Sangrias and the smooth Absolut Vodka with Sprite. We gracefully shook our heads when offered some accepting the fact that we were probably the youngest at the soiree! But soon after, numerous appetizers made their way to our table. 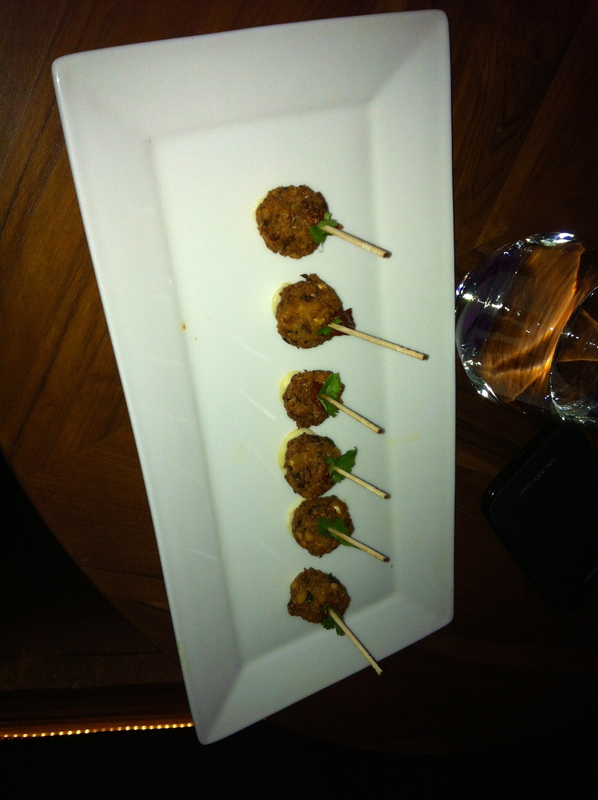 The first appetizer that we tasted was Falafel with Hummus. We loved it at that time as we were super hungry! But they were nothing out of the ordinary. 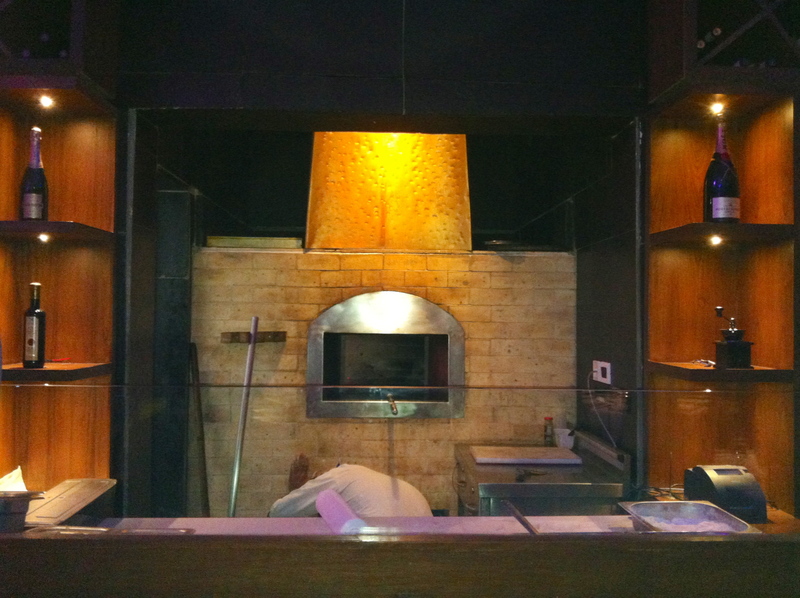 Next we could smell some delectable pizzas and our glance instantly turned towards their wood fire oven. By now I am sure you would know that Italian is the thing for me! Well, then we were served this amazing Sauteed Mushroom and Spinach Pizza with trufle scented rucola. I never knew that Spinach and Mushroom could blend so well!!! And as far as rucola is concerned, it is an alternative term for Arugula which is a rocket plant used in Italian cooking. These were simply evanescent! Then came the Calzone Verdure Pizza right out of the oven, this one was stuffed with mozzarella, ricotta, spinach, caramelized onions, peppers and zucchini. 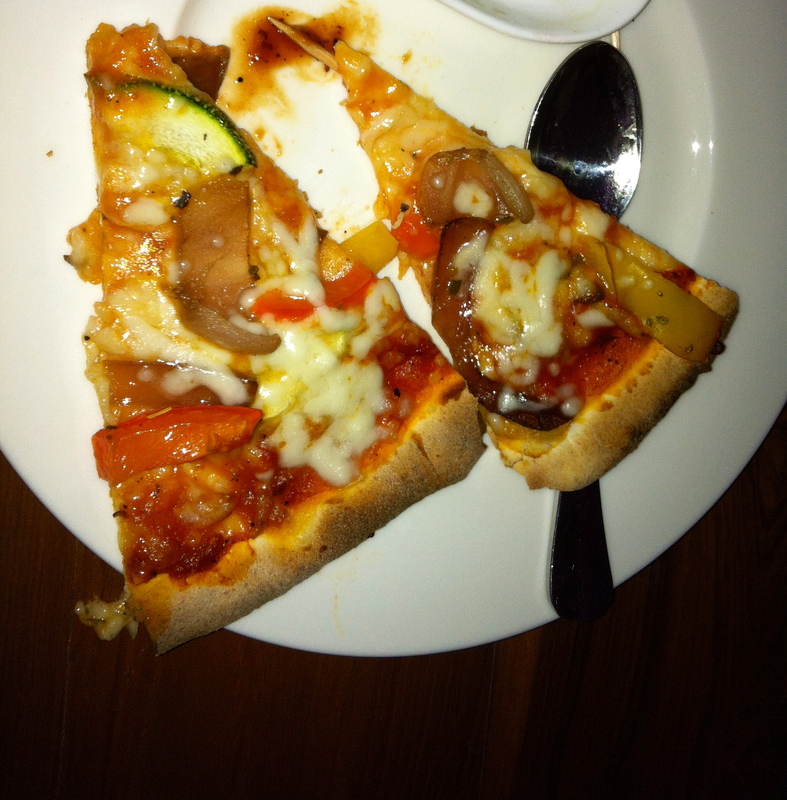 It was yummy as well but I would surely rank it after the Spinach and Mushroom pizza! 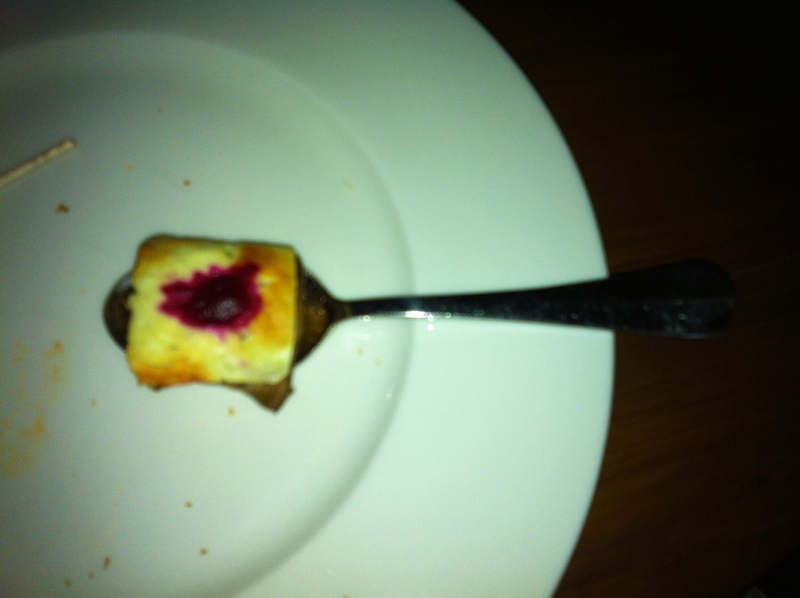 Then we were served some Grilled Halloumi wrapped in aubergine carpaccio with paw paw mollasses and beetroot puree. 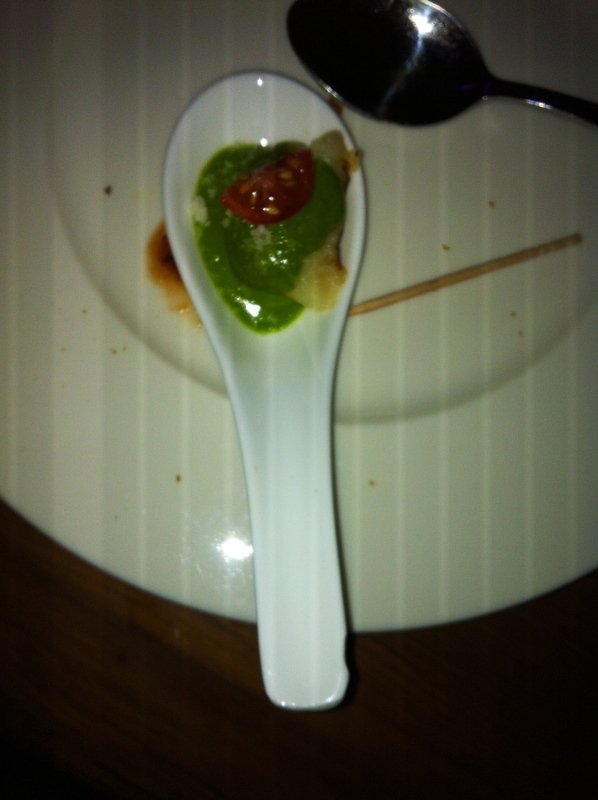 The look of this appetiser, which was served in a spoon, was pretty mesmerizing but I must say the taste disappointed me! 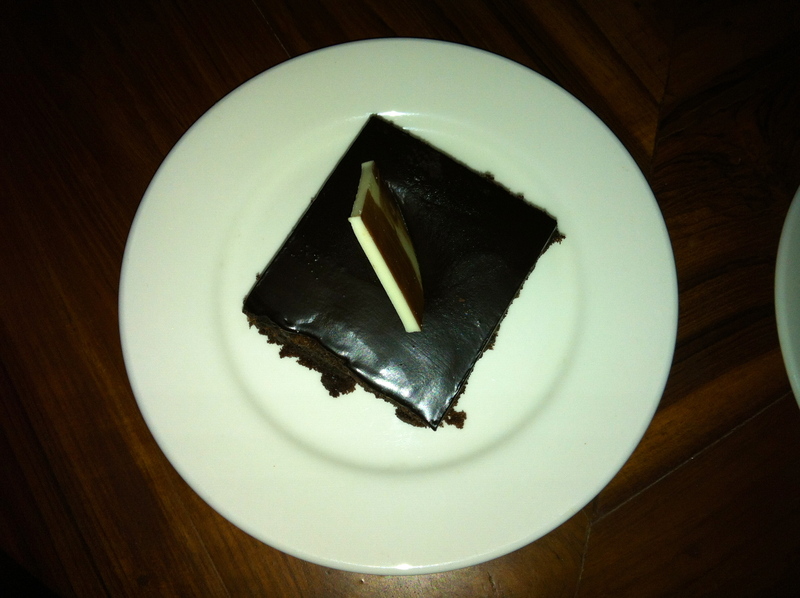 The sweet taste dominated this one, giving no recognition to any other flavor and the rest was a cloying story! Well, Halloumi for your kind information, is a mild, firm, white Cypriot cheese made from goats' or ewes' milk. 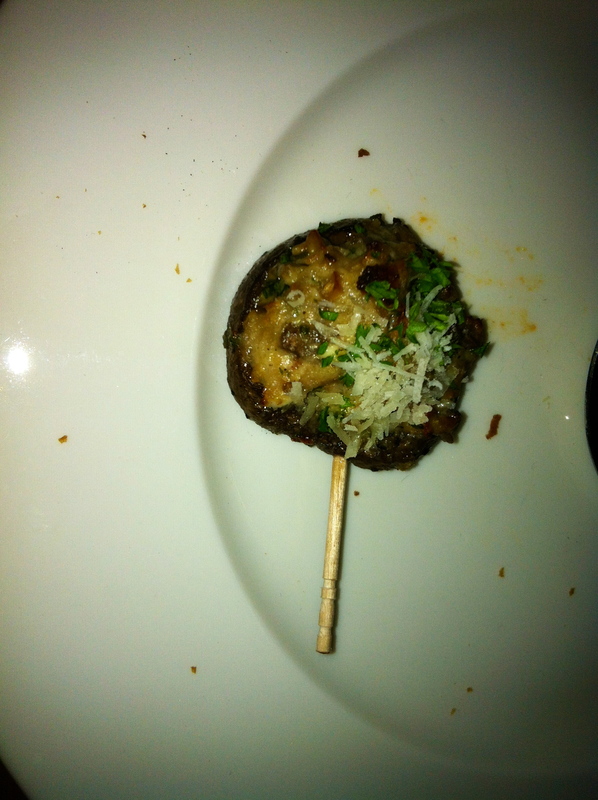 As we indulged in a hearty laughter at the stand up comedy of Angad (@piratedsardar) we pigged out on some Chevre Stuffed Mushrooms with some sweet and tangy barbeque sauce. They were juicy and supple as ever and amazingly flavourful! As the Valentines fever set in and all of us were asked to play a small word game, we devoured some Patata Gnocchi tossed in spinach and Parmesan. Patata is literally potato in Italian and Gnocchi is like a small dumpling made out of potatoes. These were something to remember with just the right blend of the sauces. 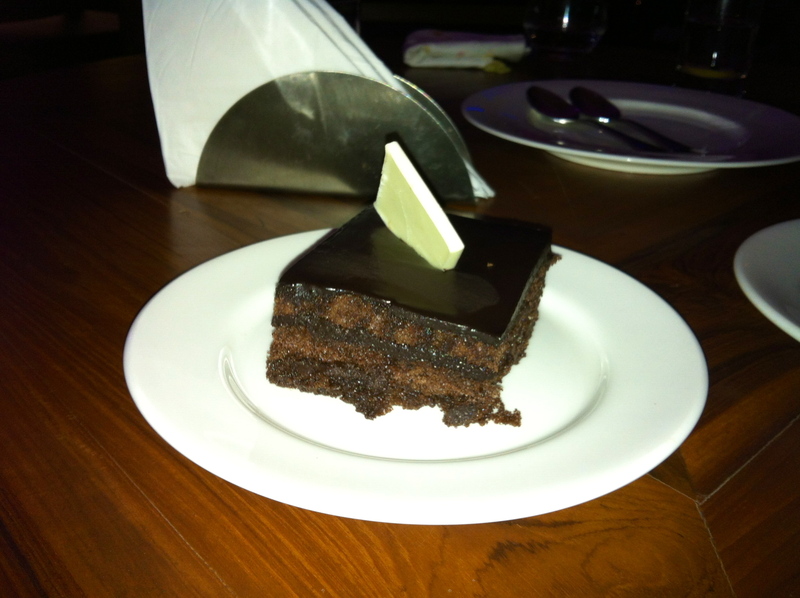 Then after a fun filled night with a lot of hobnob, we were finally treated with the most awaited Valentines Special Menu. 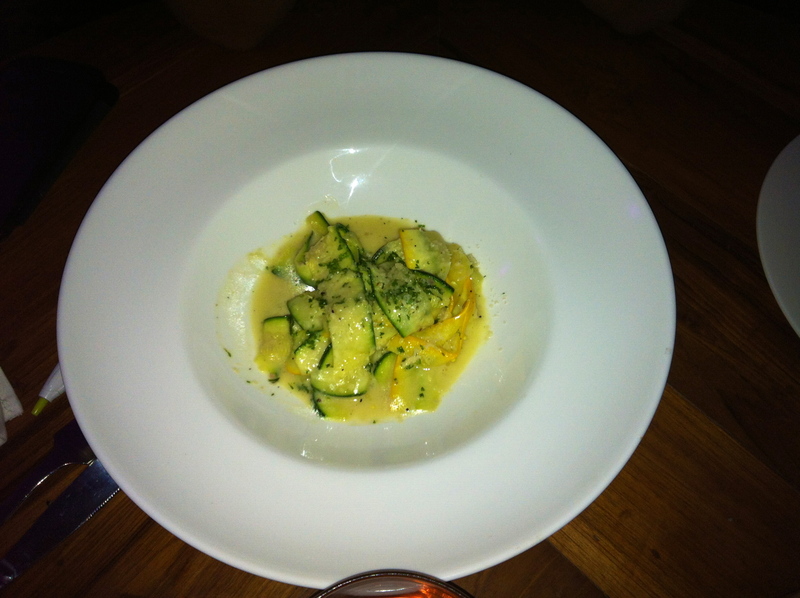 Firstly, we were brought the Zucchini Papperdelle in creamed truffle sauce topped with olive and herb pistou. This had the taste of a salad as against a proper main course dish and was rather bland! Contrary to my friend's belief I did enjoy it nevertheless! 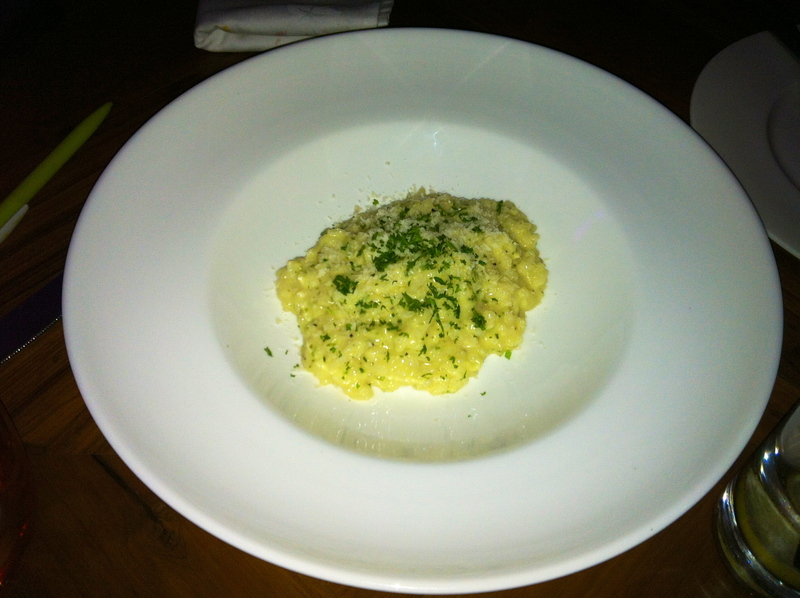 And then we had plenty of noshes and nibbles at the Saffron Risotto with Parmesan and Chives. Chives are the leaves of a widely cultivated small Eurasian plant related to the onion and they indeed stole away the show in this case. This was rather filling and a great end to our main course. Finally it was time for the best part of our meal! 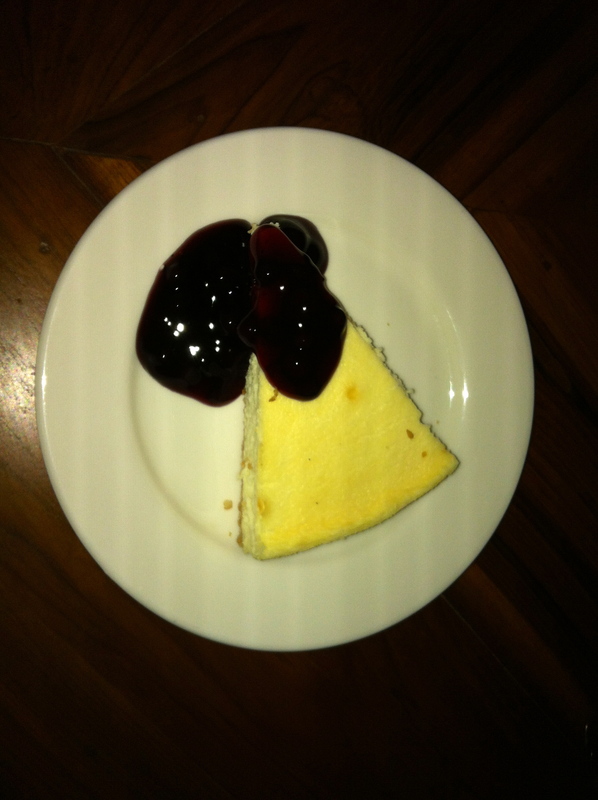 DOLCI, as they call desserts in Italian! 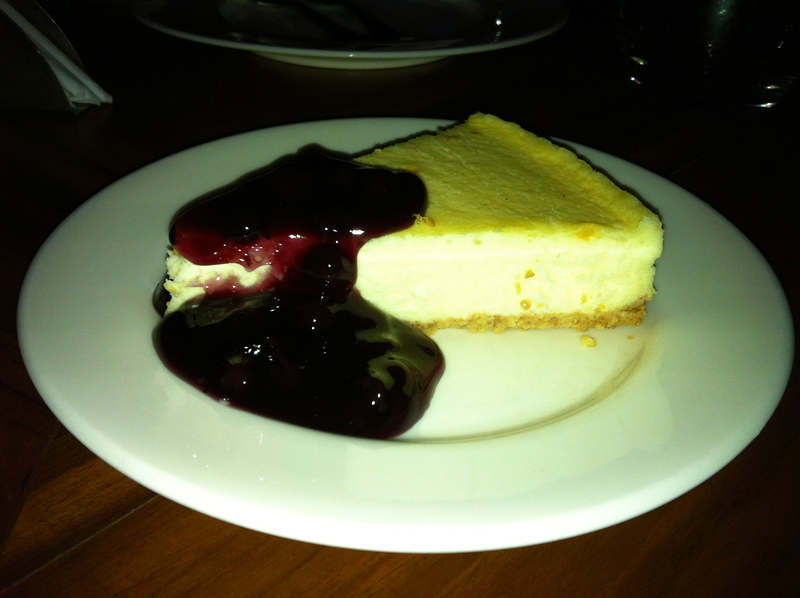 We went for the Baked Philadelphia Cheesecake with Blueberry compote. Well, it wasn't one of the best I have had so far but was luscious enough! However, it could have been more toothsome! And then putting a full stop to our day's share of edibles was a Chocolate Truffle Pastry which was indeed mouthwatering and tasty! 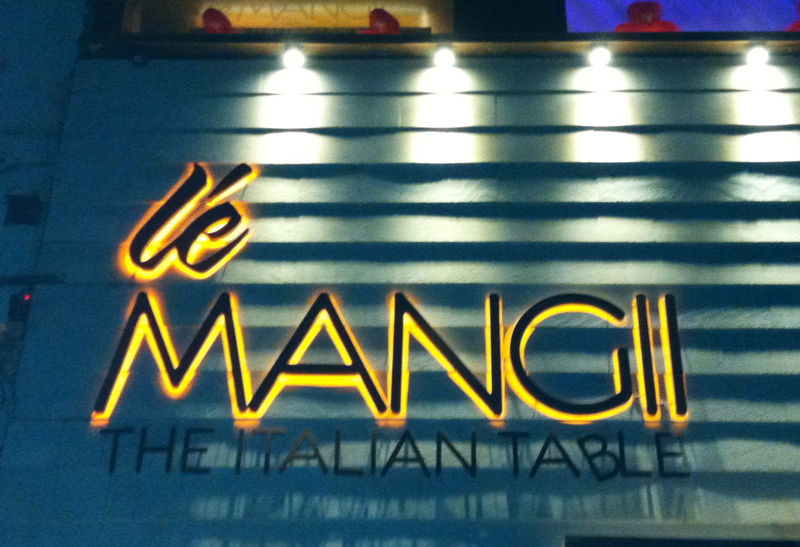 So, Le Mangii is one of the finest options for a classy eating experience. Be it their breakfast menu, or catching up with them for lunch or being all decked up and dropping in for an avant garde Italian dinner, this is an 24 hour place! I can very well say that this 'Italian Table' made my 2014 Valentines eve remarkably noteworthy!